Thank you so much @steem-untalented for the mention. @surpassinggoogle, thank you so much for being one awesome human. @euronation loves you and wishes you well. Congratulations to all Untalented steemians featured here. Lots of featured posts there! Congratulations everyone. Thanks @surpassinggoogle for giving notice on a lot of posts! 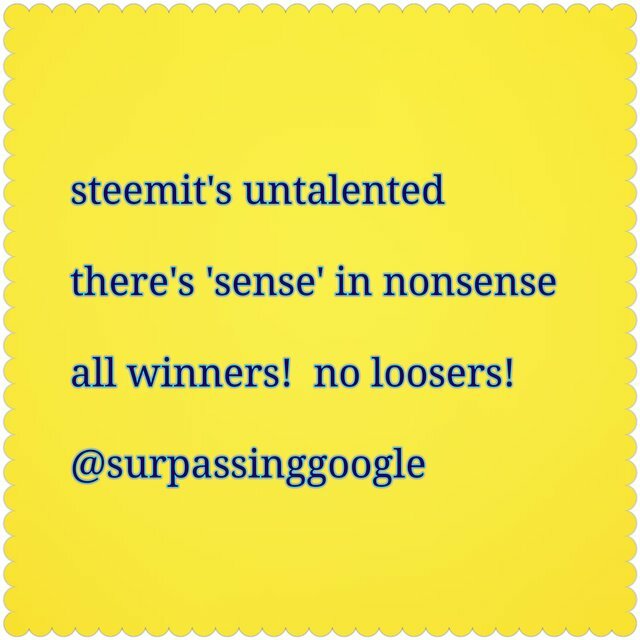 Congrats again for the #untalented steemians. A well deserved curation. Keep it up. Giant strides making here too. There's a place where every talent is welcome and there are no flaws, that's Here! Seeing the featured posts here is so liberating. Happy for you Steemians and congratulations. Well deserved featured posts. Good morning @steem-untalented. Thanks for always rewarding humanity's attempt at out of the boxness. Congratulations to all those featured, stay amazing as always.